We’ve just wrapped up the largest SUP race ever seen in Australia. 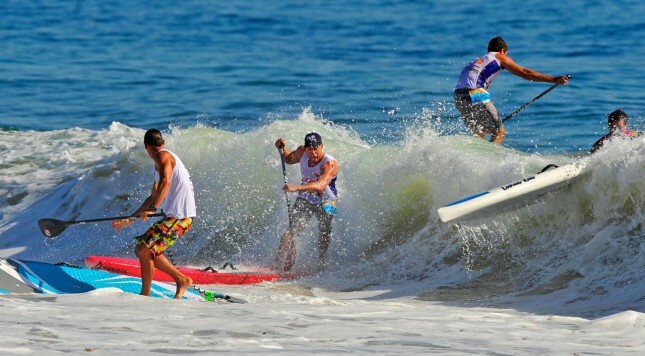 The Forster Island Paddle Festival, held on the Mid North Coast of New South Wales (Google Maps), attracted hundreds of stand up paddlers for a weekend of sprint, surf and flat water racing. I don’t have the exact number yet but it sounds like it was pushing 250 competitors all up, which would make Forster Australia’s biggest ever SUP race in terms of participation (and by a long way). The level of competition didn’t exactly match the Battle of the Paddle, however there were still quite a few well known, world ranked paddlers on show, with the strongest performances coming from Angie Jackson, Titouan Puyo, Paul Jackson, Karla Gilbert, Jake Jensen and Celine Guesdon. Jake took out the first event of the weekend, the highly-entertaining Battle of the Paddle-style race in the waves. Conditions were almost perfect, with calm winds and a punchy little swell creating plenty of opportunities to make a move (and get on the carnage highlights reel). Jake and his sparring partner Paul Jackson made the early jump, with visiting New Caledonian world beater Titouan Puyo getting caught up in the pack off the start. Titou quickly fought his way back to make it a three-way race, before a slight mistake from Jacko whittled the contenders down to two. Jake had trouble shaking the reigning ISA distance race world champ, who’s come a long way with his surf racing skills in the past twelve months, however he finally paddled clear right near the end. Jake came home to take the win ahead of Titou (2nd), Jacko (3rd) and impressive youngster Tim Cyprien (4th), as the rest of us battled in and out through the solid shorebreak for the minor placings. Post by Forster Island Paddle Festival. In the women’s BOP race it was always going to be a two-way battle between Australia’s top two ladies, world #6 Angie Jackson and the former Queen of surf life saving Karla Gilbert. France’s Celine Guesdon, who’s in Australia for a two month training holiday, put up a good fight, however Karla and Angie were out in front right from the first buoy. The two were neck and neck in the opening laps before Karla’s strong surf skills (she’s a seven-time winner of Nutri Grain Ironwoman Series – one of Australia’s premiere ocean races) allowed her to break free and take the victory. Saturday afternoon we moved from the surf beach back over to the protected, flat water inlet, where the next event was the 200m “Dash For Cash” sprint. This was a one-race, winner-takes-all, straight up final. In the women’s, Angie Jackson took off like a rocket and simply couldn’t be matched, despite a strong fight from Karla and Celine. Angie has been training like an absolute machine lately and the results are really starting to show. The 200m Dash For Cash would prove to be a family affair just five minutes later, with Angie’s husband, Paul Jackson, taking out the men’s sprint in impressive fashion. Despite being up against Jake – the current world #4 and the 2014 BOP Elite Race runner-up – Jacko got the quickest start and powered home to remain undefeated over the distance in Australia (Jacko also won the 200m sprint at the inaugural Australian Flatwater SUPFest last year). Both Paul and Angie are insanely hard working, hard training competitors, so it’s great to see them getting rewarded for their hours on the water and in the gym. Also interesting to see their board of choice since leaving Team Fanatic last month. It was also quite interesting to note that the 2015 14’x25″ Starboard Sprint took four of the top five places in the men’s plus first place in the women’s. Even more interesting when you consider none of those five paddlers are actually sponsored by Starboard (Titou is on Team Starboard, but he didn’t race in the Dash For Cash). That means the competitors all chose the Sprint because they believed it was the fastest option available. The Starboard Sprint has always had a good design but this 2015 model really seems to be the flat water board of choice at the moment. So that was Saturday. On Sunday we had the biggest race of the weekend, the 2k/5k/10k flat water loop around the island. The elite guys and girls lined up for the 10km course, with the usual suspects getting off to a quick start. A traffic jam at the first buoy saw the lead four guys – Jake, Jacko, Titou and the impressive Ben Tardrew – gain an unassailable lead. Behind them there were plenty of personal battles right down the order, with a spot in the top 5/top 10/etc, as well as priceless bragging rights up for grabs. By the halfway point of the 10km course, Jake, Jacko and Titou upped the pace and dropped Ben, while Angie and Karla were once again locked in a neck-and-neck battle. Although the course was held in a protected (and very scenic) inlet we still got a good variety of conditions: A slight downwind leg, a painful upwind section and a good stretch of calm flat water. The lead trio would stay together pretty much all the way to the line, with each of them jockeying for position over the final stages. Titou took the lead in the final klometre and despite their constant attacks, neither Jacko nor Jake could pass the New Caledonian. So Titou took the win to go one place better than his finish in the BOP. Jacko finished second, out-gunning his former Fanatic team mate Jake for the second race in a row. Ben Tardrew came home in 4th with Steve “Wild Man” Walker rounding out the top five. In the women’s 10k, Angie eventually broke free from Karla on the upwind stretch and powered home to make it two out of three for the weekend. Angie’s impressive performances were a shot across the bow ahead of the approaching international race season. For the board snobs out there: Titou was paddling the brand new “Race” model from Starboard (14’x25″), Jacko was on the 2015 14×24′ Sprint once again, while Jake was on the brand new 14’x24″ Fanatic flat water board (the “Strike” I believe it’s called). Fourth-placed Ben Tardrew was on a 14’x24.5″ NSP pro model (the same board Travis Grant took 2nd with at the BOP Distance Race last year) while fifth-placed Steve Walker opted for the same board as Jacko, the Starboard Sprint. Angie was on the Sprint as well, while Karla had the Naish Javelin LE (2014 model) and Celine was paddling for BIC. The weekend finished with the novelty team relay, a no rules kind of race that certainly gave the crowd plenty of entertainment. Earlier, the top paddlers had been auctioned off for charity, with the seven corporate teams each bidding for the rights to have one of the stars in their squad. All the money raised went to charity and for the record, Jake Jensen was the most expensive acquisition at $500. The race itself was a complete destruction derby, with pretty much everyone focusing less on their own race and more on trying to block the opposition. Definitely a fun way to finish the weekend, and the elite paddler charity auction was a very innovative way to run the relay. A race with 200+ competitors might not sound significant if you’re from a hotspot like Florida, however Australia, despite its rich pool of elite talent, has never had many big events. So the Forster Island Paddle Festival is a great sign for the sport, especially considering this was the first ever Forster Island Paddle Festival. It was a good event but there’s plenty of room for improvement, so I can only imagine 2016 will be even bigger and better. But anyway here are the top finishers from across the weekend.